Riding ATVs (All Terrain Vehicles) with Aventuras en ATV's in Ixtapa-Zihuatanejo, Mexico offers visitors the opportunity to experience the ultimate thrill of the ride! 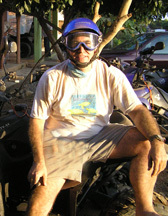 Ignacio "Nacho" Leon, owner of Aventuras en ATV's, started his company in October 2007, which we had the pleasure of experiencing in December 2007 during a trip to Mexico. Hooked on riding ATVs since we first rode them in Brazil, this was an adventure that we had to experience in Ixtapa-Zihuatanejo. Adventura en ATV's is a member of Asociación Mexicana de Turismo de Aventura y Ecoturismo A.C. (AMTAVE) (www.AMTAVE.org) (Mexican Association of Adventure Tourism and Ecotourism), whose mission is to promote and protect ecotourism and adventure-related activities and sites in Mexico. 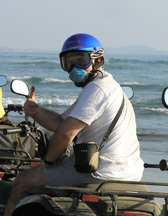 Equipped with brightly colored helmets, goggles, and facemasks, we climbed aboard "our" brand new 260cc automatic ATVs, and after receiving operating instructions from Nacho, we were ready for the fun to begin. Led by Nacho and Rosendo, the mechanic for Aventuras en ATVs, our 2-hour adventure began by driving through a small town where we waved to the residents who smiled and waved back at us as we rode past their homes. Our journey continued as we drove over dirt trails taking us through a coconut plantation where the towering trees were abundant with nature's bounty, and past a cattle farm where the cattle grazed as they looked at us with what appeared like amusement in their eyes at these strange creatures (us) on these even stranger machines (ATVs). The scenery was amazing as we watched many variety of birds flying in the distance including a bright pink Roseat Spoonbill, and the interesting play of dappled light filtering through the trees and onto the trails edged with colorful tropical flowers, and as for the ride, it was fantastic as we flew at top speed navigating the hills and valleys like true professionals. There is something about riding ATVs that brings out the spirit of adventure in anyone who experiences them, and since they have four-wheels, they are easy to ride, stable, and with automatic ATVs do not require any special skills to ride them other than a sense of adventure. We rode over dirt trails with the dust flying in the air around us, navigated the ATVs through small streams, and when we finally arrived at the entrance of the long stretch of beach, Nacho informed us that we would be riding in an ecotourism area, and that we needed be respectful of not riding near the residences located along the beach, as well as to only ride behind the leader on the edge or the hard parts of the beach. Our hearts raced in anticipation of the thrill of being able to ease back the throttles on the handlebars and open up the motors and ride full speed ahead over the hard packed sand. Riding on the beach was almost dreamlike with its seemingly endless stretch of white sand outlined with majestic swaying palm trees, rolling waves lapping at the shore, feeling the warmth of the bright afternoon sun shining on our backs, and the extreme beauty of the land. Reaching the end of the beach there was a rock wall covered by vegetation, and we stopped to relax savor the moment, knowing that we would later want to recall this memory. It was a peaceful day where we watched a man ride his horse down the beach, others who came by bicycle, to come and enjoy the beauty and to play in the waves. Dusty and warm, and with the Pacific beckoning invitingly (Debra) decided that it was time to go for a swim, and removed her tennis shoes, then dove into the waves fully clothed. Refreshed from the swim, we sat on our ATVs and watched Bruno, an experienced ATV rider, have some fun with his ATV by riding on two wheels along the beach. It was definitely exciting to watch him, and although we did stand up on our ATVs, riding on 2-wheels was not something that we were ready to experience on this trip, perhaps that will be something to try on our next adventure, as we are not called The Adventure Kids for nothing! 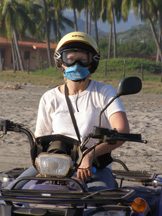 As we rode back along the beach and over the trails, we waved to whomever we passed, as we committed to memory this extraordinary experience of riding ATVs in Ixtapa-Zihuatanejo. 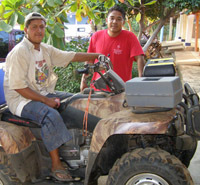 Aventuras en ATVs is open to drivers 16 years and older, and passengers with a minimum age of 12 years. 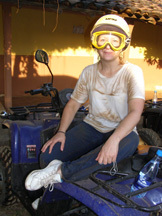 If you have always longed to feel the thrill of riding ATVs, you will love this experience!